When asked how many bikes I own, I often jokingly reply, only “too”. As in too many. But of course you can never have too many bikes. Actually, I currently have 26 bikes for individual use, three other women’s bikes that are part of his and hers matching sets, plus four additional bikes designed for multiple riders,. After I started riding again I had just one bike for many years. So I didn’t start out with a lot of different bikes. It just happened over time. But I imagine many addicts would say the same thing. In my defense, I will say that out of a total of thirty-five single-rider bikes I’ve owned during my lifetime, I’ve only ever purchased four of them new. All of the other bikes I’ve bought were used or rebuilt and, therefore, were very affordable. The first additions to my stable of bikes were acquired from a community bike co-op, and a used bike shop run as an after-school program for at-risk kids. I justified getting them by telling myself that I was helping others by buying bikes at places like these. Eventually, however, I could be found trolling through the ads on Craigslist or auctions on eBay looking for more bikes. I have not spent as much money on my addiction as many people spend on theirs. However, I must admit that one of my biggest fears is that when I die my wife will sell my bikes for what I told her they cost. 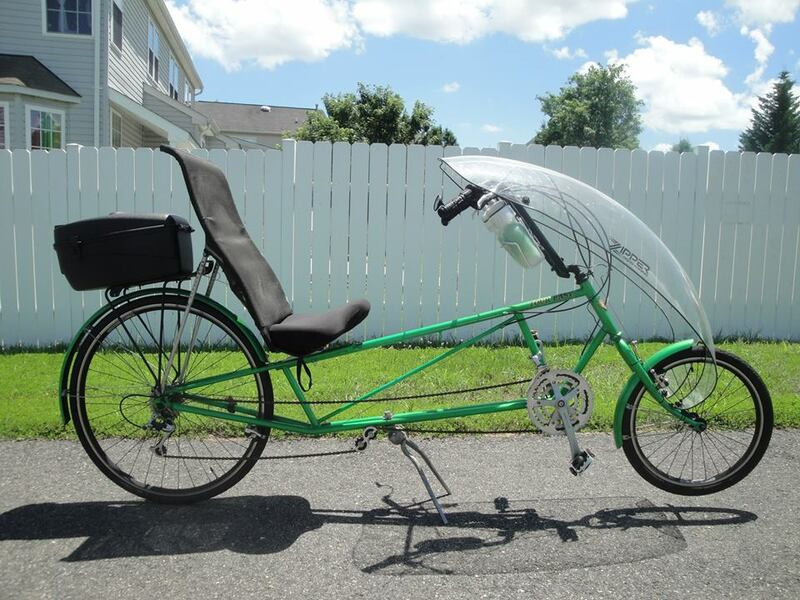 Another one of my favorite bikes is my first recumbent – a 1997 Pearl Lime Green Tour Easy by Easy Racers. A recumbent is a bike that places the rider in a laid-back reclining position. Most recumbent riders choose this type of design for ergonomic reasons; the rider’s weight is distributed comfortably over a larger area, supported by the back and buttocks. Most recumbent models also have an aerodynamic advantage; the reclined, legs-forward position of the rider’s body presents a smaller frontal profile, which creates less wind resistance and makes them faster. I don’t have any health issues or ailments that prevent me from riding upright (also known as diamond frame, traditional, safety, wedgie, etc.) bikes, as some recumbent riders do. The fact is that I ride upright bikes too. I ride a recumbent because it’s fun and fast. 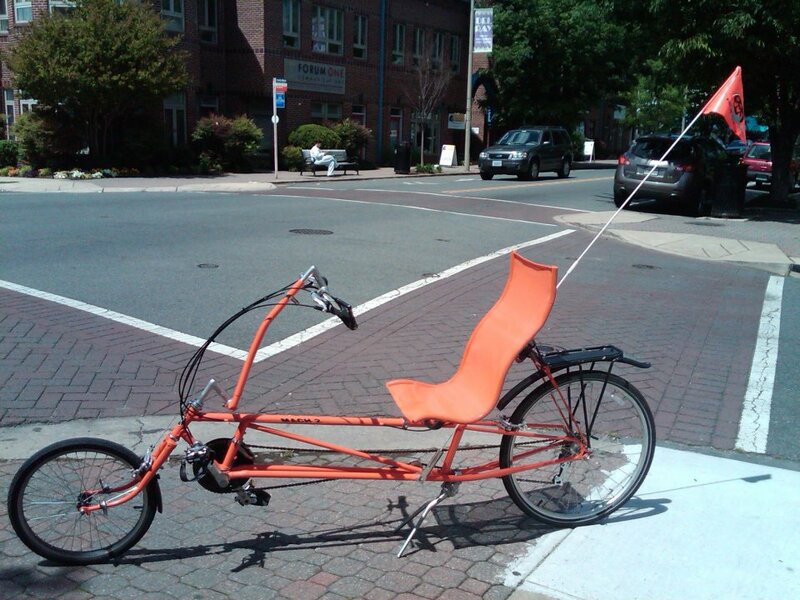 After reading online about recumbent bikes, and test riding a couple at a local recumbent bike shop, I found this long wheelbase recumbent through an ad on Craigslist. And I think maybe one of the reasons I liked it right away is that it reminded me of a modern, grown-up version of my first bike. The purchase of a recumbent bike whetted my appetite, and my next bike purchase perpetuated this when I bought another recumbent. However, my second recumbent cannot technically be called a bike. By definition a bike, or bicycle, is “a vehicle with two wheels in tandem, usually propelled by pedals connected to the rear wheel by a chain, and having handlebars for steering and a saddlelike seat.” My second recumbent failed to meet this definition in multiple ways. The first difference is that it has three wheels instead of two, making it a trike. Trikes come in two varieties, the “tadpole”, with two front wheels like this one, and the “delta”, with two rear wheels. My recumbent trike also has a different type of steering system than handlebars, and a reclining rather than saddlelike seat. 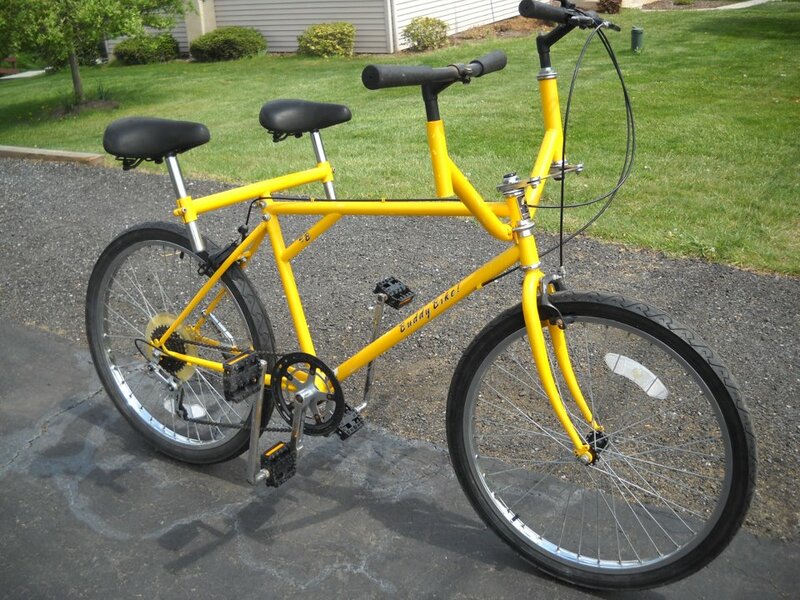 It is a 2009 Sunset Gold TerraTrike Zoomer Elite, which I also bought through an ad on Craigslist. 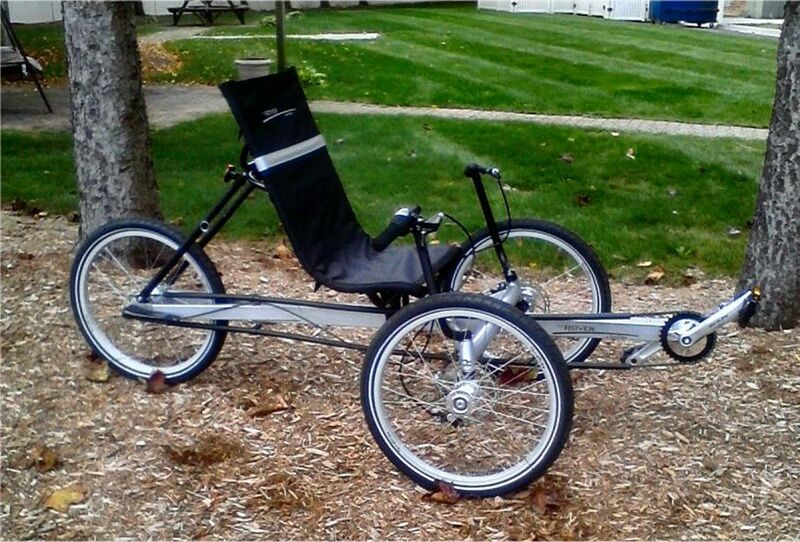 Recumbents have a comfort level and a cool factor that cannot be denied, and trikes like this take it to another level. Rounding out the types of recumbent bikes I (currently) own is my Lightning Cycle Dynamics P-38. Differentiating it from my other recumbent bikes is the short-wheelbase design. Long-wheelbase models like the Tour Easy have the pedals located between the front and rear wheels, whereas short-wheelbase models have the pedals in front of the front wheel. Short wheelbase recumbents have more equal weight distribution between the two wheels, and a smaller turning radius and greater maneuverability. These differences make the riding experience between the two kinds of recumbents equally different. Despite the fact that the body positioning, pedaling motion, and balance necessary to ride a short wheelbase recumbent make it more difficult to get used to initially, it is very much worth the effort. But the most significant difference between this type of bike and all other bikes is its speed. This type of recumbent holds the world speed record for a bicycle. They are so fast, in fact, that they were banned from racing under the Union Cycliste Internationale (“International Cycling Union”), which is the world governing body for sports cycling and oversees international competitive cycling events. This bike, which I bought from a local bike shop named Bikes of Vienna that was selling it used on consignment, is both a fun and fast bike. Having ridden both types, when it comes to recumbent bikes I prefer long-wheelbase over short-wheelbase models. However, I like intermittently switching off and riding all kinds of different bikes. For me that helps to keep riding fresh and interesting. So when this 2000 Midnight Black Lightning Cycle Dynamics Stealth presented itself on an eBay auction, and was listed with free shipping, I followed the auction. And when it was nearing the end of the auction and no one had bid on it, I entered the minimum bid. That was good enough to win the auction, and I now have a second short wheelbase recumbent. The Stealth combines the record-breaking design geometry and seat of the legendary P-38 with a strong chromoly monotube construction for the fastest recumbent in its class. 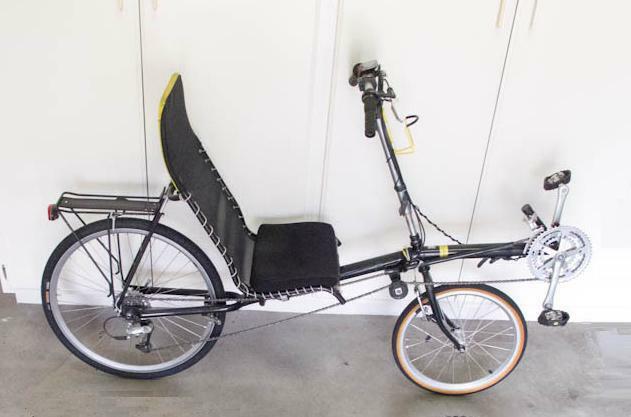 Perhaps the best all-around recumbent on the market, it is great for any club, recreational, touring, or commuting cyclist who wants a high performance, fun to ride, and very comfortable bike. This recumbent bike is a 2004 Patriot Blue Cannondale Bent II. And with the purchase of this bike I combined two of my favorite kinds of bikes – recumbents and Cannondales. As I said previously, recumbent bikes are generally divided into two catagories: long-wheelbase and short-wheelbase. But this bike falls somewhere in between. The pedals are positioned very close behind the front wheel and the seat is high over the small rear wheel, thus reducing the bike’s overall length. So it is considered a “compact long-wheelbase” bike, also sometimes referred to as a “medium-wheelbase”. I bought this bike on eBay but was able to pick it up from the seller who was local. I got it for a great price, and without any shipping costs it was just too good of a deal to pass up. And I’m glad I bought it. The Cannondale Bent II is unique in that it has an oversized aluminum built-in-the-USA frame, rear suspension, and fine Cannondale finish quality. While not a super performance bike, the Cannondale Bent rides well, is durable, and an ideal all arounder. 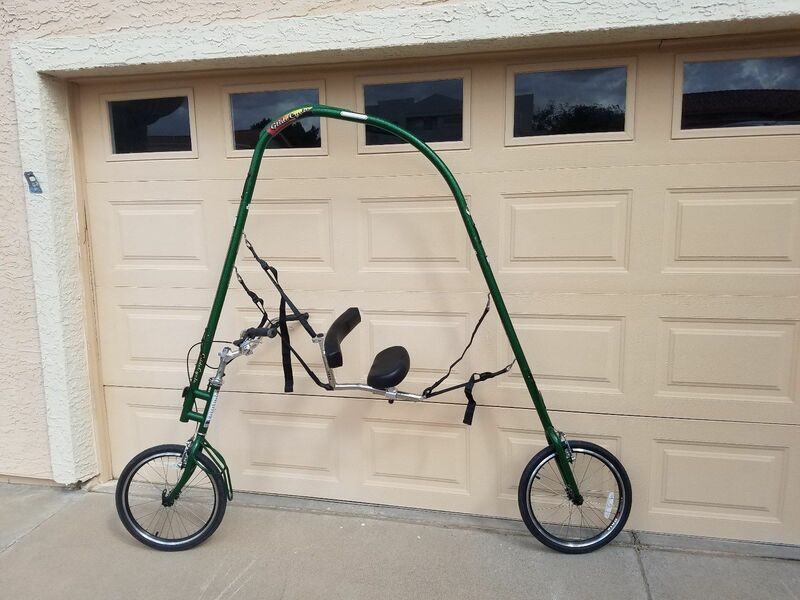 One day when I was leisurely browsing through the bikes on eBay, I came across an auction for a used Recycled Recumbent bike. And the location listed was not that far away, so I figured I could save on the shipping costs if I bought it. But since I already had one at that time, I decided I wouldn’t be willing to pay very much for it. So on a whim I submitted a low opening bid. A week later when the auction closed mine remained the only bid. 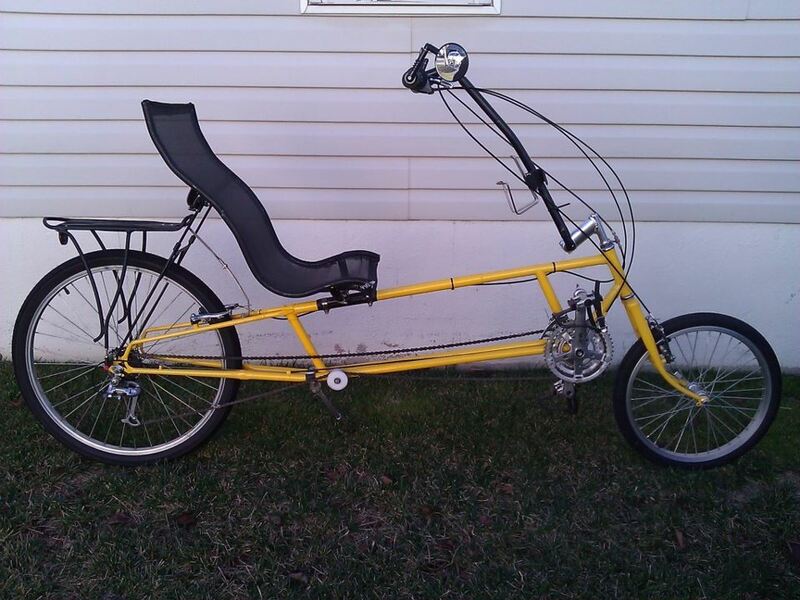 So I bought my second Recycled Recumbent Mach 2 for a very low price. Since I already had one I kept at the office (named Julius), I kept this one at home for several years. But eventually when I made the difficult decision to retire Julius I took this one to work to replace it. It is currently the primary recumbent I keep at the office for my daily lunchtime bike rides. My addiction to buying bikes manifested itself again when I was perusing the online forums on the messaging section of a site named BentriderOnline. 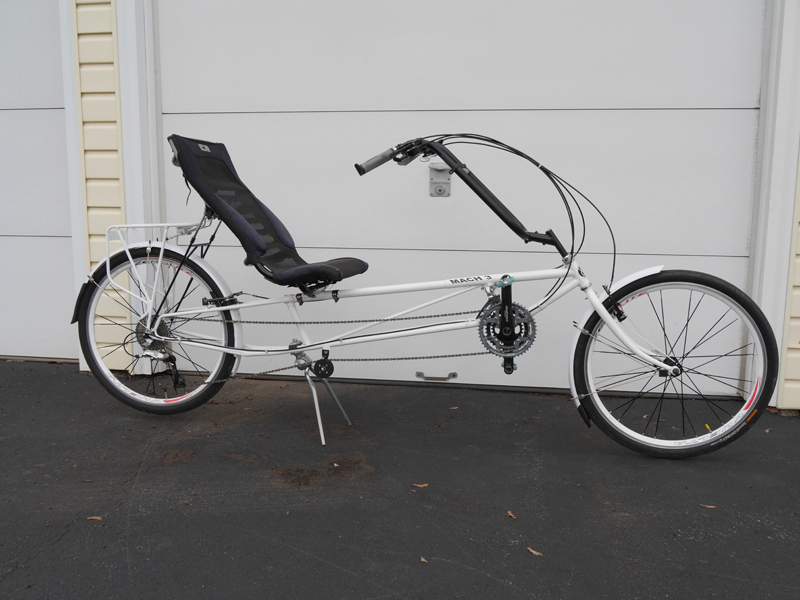 This is where I saw this Pure White Recycled Recumbent Mach 3 for sale. However, it was located in upstate New York and was advertised for local pickup only. And the seller was letting it go because he needed to make more room in his garage. I really wanted the bike, but my schedule wouldn’t allow me to pick it up anytime soon. So I jokingly posted a photo of the bike on my Facebook page, lamenting that I wish I could buy it. It was then that I received a message from a cousin who lives in upstate New York, suggesting that if I bought the bike he could store it for me in his garage until I could come get it. I knew that the bike was meant to be mine when I messaged the seller and found out that he lived only two miles from my cousin. So I sent him the money, and he delivered the bike to my cousin’s house by riding it over, and then walking home. 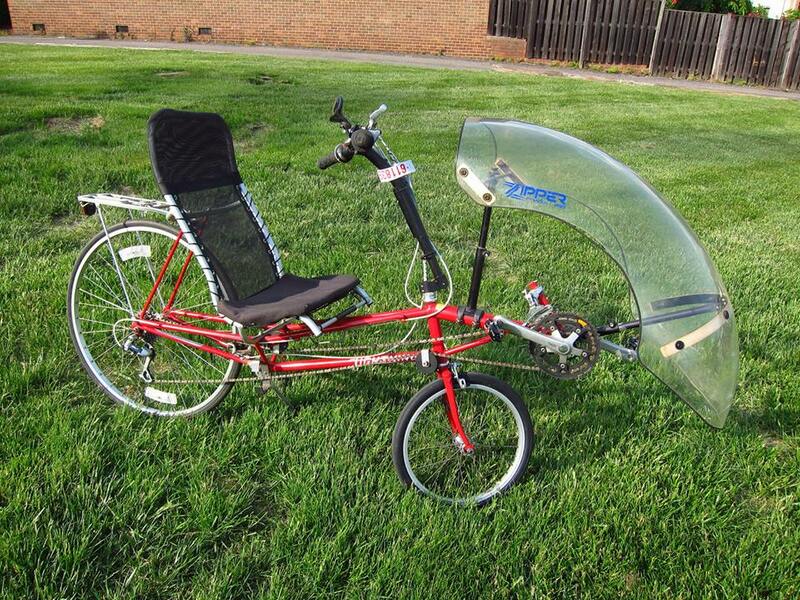 The Recycled Recumbent Mach 3 is a dual 26” wheel, long-wheelbase recumbent. It’s possible to put a larger wheel on the front of a Mach 1 or a Mach 2, but the resulting bike handles like a drunk cow. Besides the difference in aesthetics, the Mach 3’s geometrically redesigned frame and larger front wheel makes it ride differently. The front wheel smoothes out the bumps along the way. So when you get this bike up to cruising speed it feels great – a real road limousine. And like most limos, this bike has a number of upgrades, including an upgraded seat and handlebars, and higher-end componentry. My most recent purchase of a recumbent was another trike. Made by TerraTrike, the same manufacturer of my other trike, this one is a Rover model. The Rover features a strong carbon steel frame, fully adjustable seat and boom, direct steering, 20-inch silver single wall wheels with CST reflective 20 X 1.75 tires, a direct drivetrain with no idlers, Promax linear pull disc brakes, twist grip shifting, and a Sturmey-Archer internal eight-speed hub. One of the reasons I bought this trike is so that one of my daughters and I can ride trikes together at the same time. The other reasons I bought it when I saw it on Craigslist is because of the description and the price. The seller described it as having been bought by his mother-in-law to use for rehabilitation, but that she barely used it and it was in like new condition. And the price was so low that I thought maybe he was trying to get back at his mother-in-law for something by selling it cheap. So the price, combined with throwing in some accessories such as several safety flags and a seat bag, made the trike too good of a bargain for me to pass up. When it eventually came time to replace the original primary upright bike that I kept at the office for my daily lunchtime bike rides, I decided that instead of just buying the first bike on Craigslist or eBay that I liked, this time I would plan out what kind of bike I wanted to get. Since I would be riding this particular bike almost exclusively in the city, I decided to go with one designed for an urban environment. Also deciding to again go with a Cannondale, I had my choice of four models: a Bad Boy; a Law Enforcement model; a Hooligan, or; a Contro. I checked into each, and decided I wanted to go with the Contro. So having decided what I was looking for, my search began. 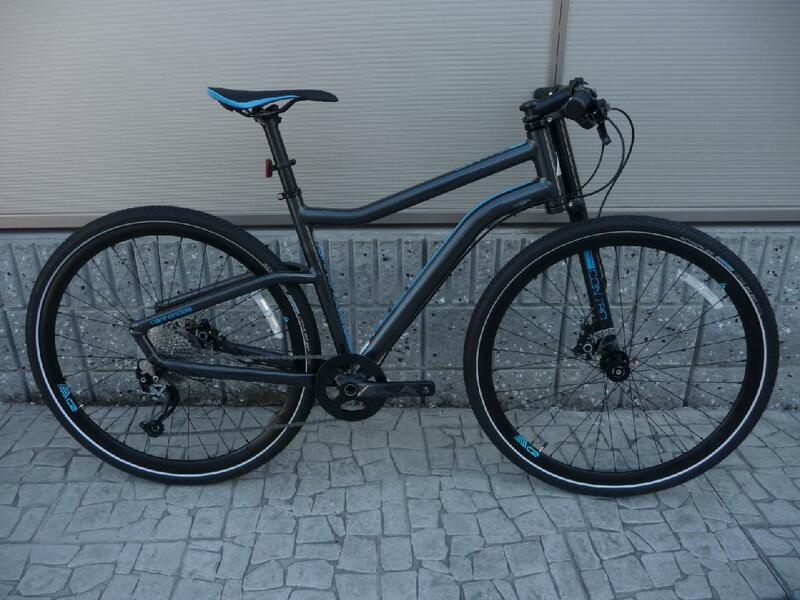 I ended up bidding on and winning an eBay auction for a 2016 Grey and Ultra Blue Cannondale Contro 4. Although it was only a few months old and barely used, I got it for well under half of the original price. And getting a good deal was necessary for me because the Contro is one of Cannondale’s higher end bikes in its category, with a higher end price tag too. Also, I was reassured by the fact that the bike was being sold by a New York shop named Piermont Bikes, who I’d bought bikes from in the past. So I knew it had been checked out and would be exactly as it was depicted in the description in the auction listing. This bike is a little different, however, from the other Cannondale bikes I’ve had in the past. This is the first bike I’ve owned, or ridden for that matter, that has Cannondale’s innovative “Lefty” front fork. The Lefty is an unusual looking fork because it only has a left side or blade, which you can’t help but get drawn in by when looking at it. And the more you look, the less it seems to make sense. But the Lefty is more than just aesthetically interesting. It is functional as well. With needle bearings instead of traditional bushings, it creates less friction than regular forks and allows for a more responsive feel. And it does not bind under torsional pressures. Another unique and practical trait of the Lefty is that it allows the user to change the inner tube or tire with the wheel still mounted on the bike. The incredible ergonomics and upright riding position of the Contro provides both comfort and visibility, with just the right amount of forward lean for confident handling and control. It also features Cannondale’s famous aluminum frame, a Shimano Alivio drivetrain with an FSA crank, Shimano M355 disc brakes, and an Alex DC 5.0 700cc wheelset. It has turned out to be a great bike, further solidifying my affinity for Cannondales. 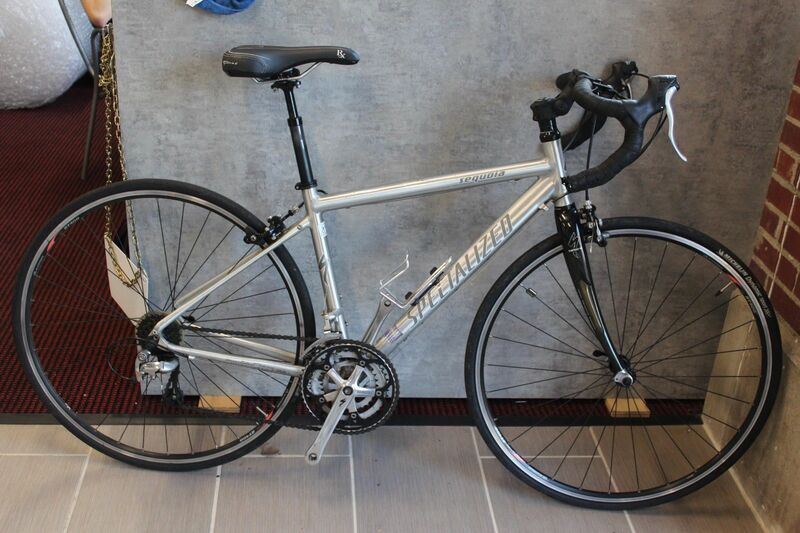 In addition to the Cannondale Contro 4 (above), I also liked another bike I saw on eBay during the time that I was looking for an urban bike to keep at work . The other bike was actually a new instead of used bike, and was being auctioned off by the same bike shop as the Contro 4. It was a 2015 Silver Scott Sub Speed 20 Commuter Urban Bicycle. Well, like many addicts I couldn’t resist the temptation. I bid on this auction too, and won it the day after I won the auction for the Cannondale. So it is now a back-up/second upright bike I keep at the office for my lunchtime bike rides. In addition to its rugged good looks, one of the things that drew my attention to the Scott Sub 20 was that it is known for requiring little maintenance. And like the Contro 4, it offers a comfortable, heads-up pedaling position as well as capable gearing. Other features of this bike include a butted 6061 aluminum frame, Shimano Alivio shifters, a Deore rear derailleur and Alivio front derailleur, and powerful Shimano hydraulic disc brakes. The bike also included fenders for cruising the city streets. Despite being a new bike, I bought it for less than a quarter of the regular price. Since I enjoy the way the bike feels when I’m riding it, and because it was good buy, I bought a second one when I had the opportunity so that I could keep one at the office permanently and still have one at home. But I guess whether or not it was a good thing that I bought two bikes when I was looking for only one depends on whether you’re looking at it from my perspective or my wife’s. Co-Motion Cycles was formed in 1988, and is located in Eugene, Oregon, which not coincidentally is one of the most bike-friendly cities in the United States. I have liked the brand ever since getting an incredible deal on our family’s triplet. But because it is a manufacturer of very high-end bikes, with prices to match, I have only dreamed of owning another Co-Motion. And when I made the opening bid on the eBay auction for this 2009 Steel Blue Co-Motion Cycles Nor’Wester, I didn’t think I would be the one who ended up buying it. I figured it was just another daydream. But sometimes dreams come true. The Nor’Wester is a road bike, but also a lot more. It’s also a touring bike, although not quite as touring-extreme as some of Co-Motion’s other models. It has a semi-compact geometric frame designed to put the rider in a bit more upright, comfortable position, yet still managing a fast ride for a broad scope of cyclists. Advertised as a “do-everything bike,” it was designed for different kinds of riding, including organized tours, credit card touring, centuries, a Gran Fondo, adventures abroad, or simply commuting in your own hometown. The Nor’Wester is one of the most valuable individual bikes I own. However, I did not pay the most for it because I got it for an incredible deal. And when I can spend a few hundred dollars but save a few thousand, that’s a bike I have to buy regardless of how many I already have. Road bikes, or racers as they are often referred to, are speed machines – bicycles designed to take you as far and as fast as your legs can manage. And as the name racer would imply, they are the type of bikes used in competitive cycling. But I’m not involved in any type of competitive cycling, nor will I ever be. A group ride is as close as I ever come, as long as I don’t have to compete with the others in the group. I’m not knocking those who enjoy competition. But for me, combining it with riding would take away much of what I get from riding my bike, looking at the scenery along the way, and stopping when I feel like stopping, and almost never having a set route from which I can’t deviate. But I eventually decided to buy a road bike for a couple of reasons. The first reason I bought a road bike is because I got an incredible deal on a used 2006 Brushed Silver Specialized Seqouia. It was being sold through an eBay auction by a seller I have bought from more than once in the past. But the auction wasn’t getting much attention. So I followed it without bidding. By the last day of the auction it had received a few bids but the price was still surprisingly low. So just as the auction was ending I placed a bid. And it was good enough to win the auction and buy the bike for a great price. The second and really the main reason for buying a road or racing bike is so that I can mix in a new kind of riding with the riding I have already been doing. My personal fastest speed on a bike is 40.3 miles per hour. The world record for a bike is 89.58 mph. Now I’m fairly confident that I won’t ever hold the world record. But I enjoy the feeling of riding fast, although it scares me a little at the same time. And getting a road bike allows me to ride faster than I have before. I also anticipate completing a century ride someday, and that will likely be on a road bike as well. The specifications and componentry are important when it comes to a road bike, and my 2006 Specialized Seqouia Road Bike begins with a TIG-welded A1 Premium Aluminum frame and carbon/steel/elastomer, aero crown front fork. It is equipped with a 52/42/30T Sugino Comp crankset, coupled with a 8-speed, 12 – 25 teeth rear cog, which aims to offer the high end speed of the race gearing with the easy climbing of a compact. It also boasts a Shimano Tiagra Rear Derailleur and a Shimano Sora, bottom-pull/clamp-on 31.8mm front derailleur. The components also includes dual pivot brakes with Shimano Sora STI levers; a TH BB-7420, 118mm spindle bottom bracket; a 1 1/8″ Specialized sealed bearing headset; a Body Geometry Sequoia Zertz handlebar, and; a Specialized Future Shock, 27.2mm diameter suspension seatpost with a Body Geometry Milano Comfort Max saddle. And it all sits on two Alex AT-400, 28-hole/32-hole rims with Specialized forged alloy hubs. Surly‘s Long Haul Trucker enjoys a reputation as one of the best riding and most value-packed touring bikes out there. It’s been around long enough to be tested in the real world, in all kinds of places, with all kinds of loads on all kinds of roads. My 2012 Surly Disc Trucker, which I bought myself as an early retirement gift, has everything the LHT does, plus it has been upgraded with disc brakes to provide a bit more braking performance than a standard rim-brake LHT can provide. Other features of this bike include: thicker-walled and larger-diameter 4130 CroMoly steel frame tubing than standard sport-touring frames; a longer wheelbase than you’ll find on a road or hybrid bike, making for maximum stability, comfort and responsive handling under load, and all the braze-ons you could want, from rack mounts to water bottle cage bosses to spare spoke holders. And the componentry includes: a Cane Creek 40, 1-1/8˝ threadless. Black headset; a Shimano UN-55, square taper interface. 68 x 118mm bottom bracket; a Shimano Sora FD-3403, Silver front derailleur and Shimano XT RD-M771 rear derailleur; an Andel RSC6, 26/36/48t. square taper interface crankset, and; a Shimano HG-50, 11/12/14/16/18/21/24/28 /32t cassette. Finally, and with all due respect to Surly’s limited factory available colors of Super Dark Green or Blacktacular, the color of this bike has also been upgraded to custom powder-coated Hi-Viz Neon Yellow. Combined with matching Deda bar tape and Hi-Vis yellow Ortlieb waterproof front and back panniers, it makes the bike almost impossible not to see while I’m out touring. 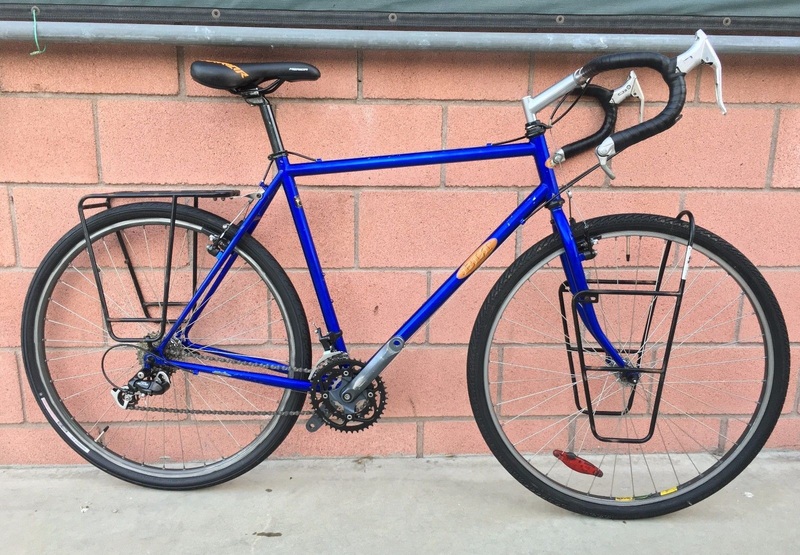 I also own a somewhat rare Basic Loaded Touring (BLT) bike designed by master bike builder Bruce Gordon, who had been producing top-tier handbuilt bicycle frames, components and complete custom bicycles since 1974. Formerly located in Eugene, Oregon, Bruce moved his one-man operation to Petaluma, California, in 1988, and had been designing and building bikes for hitting the open road up through 2017. Normally I would not be able to afford even a Bruce Gordon frame, let alone a complete bike. 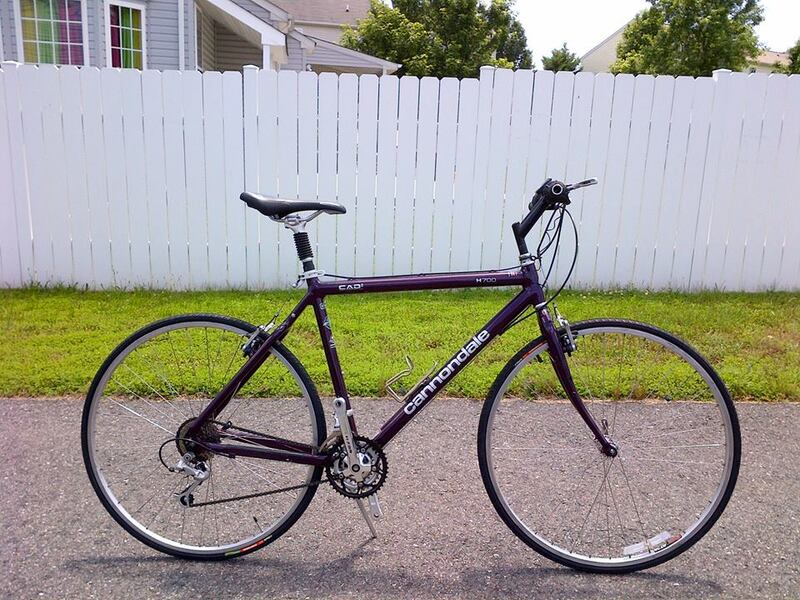 But I bought this bike on an eBay auction and was able to get it for approximately the same price as the front and rear touring racks would cost, which were also included with the bike I bought. And as I would find out the day after I won the auction, I ironically bought this bike on the same day that Bruce announced on his blog that he was retiring and putting Bruce Gordon Cycles up for sale, hoping the name and brand would go on. Unfortunately, that did not happen. And Bruce Gordon Bikes closed down in the fall of 2017. So the originals built while Bruce was still working are finite in number and will soon be considered even more rare than before. My BLT is a deep royal blue, while most of the BLT’s were basic gray. The stickers on mine are also different in appearance than those on other BLT’s, which had a blue lettering to match the powder-coating color the touring racks were available in. But I contacted Bruce prior to paying for the auction, and he confirmed to me that it is one of his bikes. So I not only have a rare original, but mine is somewhat unique as well. I bought the BLT when my first long-distance tour was still in the planning stages. In fact, buying a quality touring bike like the BLT was part of the planning. And it is now an integral bike in my collection. After I started riding again I encountered a number of paths and trails that looked like they would be fun to ride, but appeared to be a bit too rugged for my other bikes. I also knew of some nearby parks that had trails specifically designed for mountain biking. 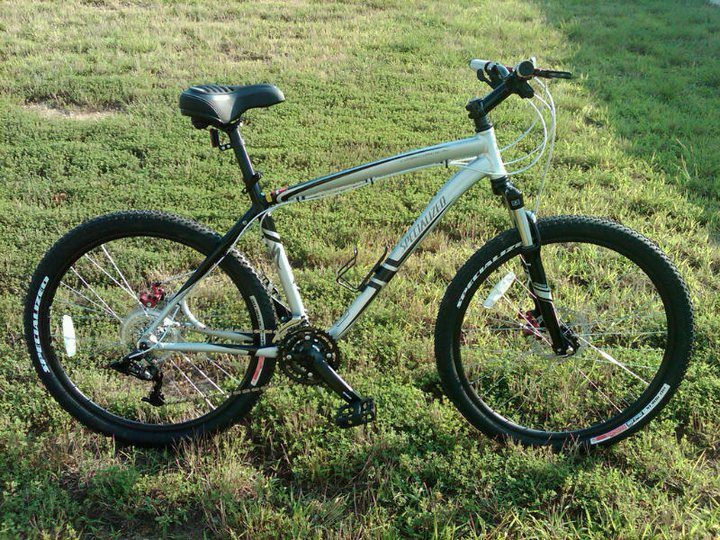 So I bought a mountain bike – a 2010 silver and black Specialized Hardrock Disc. At first I looked on Craigslist.com and eBay, but decided on buying a new one instead. I bought it at a local bike shop named Olde Town Bikes. Sometimes it’s worth the money to buy the right thing, and this turned out to be the case with my mountain bike. It works great and has really added to the biking experience by providing an alternative to road and trail riding. And I haven’t let the fact that I fell and broke some ribs on one of my first real mountain biking rides keep me from getting back out there again once my injuries healed. There are times, however, when I want something a little different than my mountain bike. For example, when it snows. Which brings me to another addition to my stable – a “fatbike.” A fatbike is an off-road bicycle with over-sized tires designed for low ground pressure to allow riding on soft unstable terrain, such as snow, sand, bogs and mud. My 2012 MRE Green Surly Pugsley has a sturdy chromoly steel frame, and Surly Rolling Darryl 26-inch rims outfitted with Surly Nate 3.8-inch tires, which can ride over almost anything. This bike makes me no longer look at snow and biking as incompatible, and riding it in the snow is as much fun as sledding. The most recent type of bike I started riding is known as a single-speed / fixed-gear bike, or a “fixie.” A fixie is a bike without a freewheel. Which means you’re not moving if you’re not pedaling. Think: no coasting. Also, riding fixed is often done without brakes. Instead, riders brake by backpedaling, applying counter-pressure to the pedals with their feet in order to slow down or even to lock and skid the rear wheel. It’s a simple concept, really, but one that provokes some serious emotion and polarization in the cycling world. Bikers either love fixies or loathe them. That sometimes carries over to the people who ride them as well. I had never even been on this type of bike before. But they looked interesting, and I’m always looking for new adventures and ways to bring variety to my riding experiences. 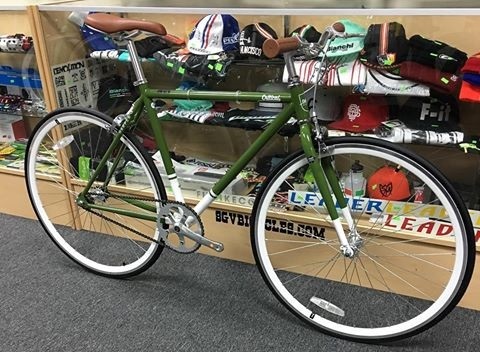 So to help me decide which side I’m on, I bought a fairly inexpensive, entry-level fixie – a 2017 Sage Green Critical Cycles Harper Single-Speed Fixed Gear Bike. The Harper is equipped with a flip-flop hub. Which means there are two cogs on opposite sides of the rear wheel, single-speed with a freewheel and fixed-gear. It can be ridden as a conventional bike, coasting forward without pedaling. But it can also be ridden as a fixie by simply removing, flipping around, and remounting the back wheel. So with this bike riding fixed is never a requirement, it’s just a choice you can make. But I’ve decided I like riding fixed. When I’m riding a fixie I feel as though I’m actually connected to the bike. It’s an intimate connection with the bike that’s as difficult to articulate. It’s like there’s a seamless connection between the rider and the bike, and it makes for a meditative experience that transcends mere transportation. The Harper is relatively simple to navigate. Typically, single-speed / fixed-gear bikes have fewer moving parts. Because there are fewer moving parts, there’s less opportunity for damage, and because there’s less opportunity for damage, there is less need for maintenance. Fewer parts also mean a lighter weight bike. If you choose to ride fixed, you’ll get an excellent workout because you’re constantly pedaling. Over time and with experience, I developed a preference for Cannondale bikes, especially older hybrids from the 1980’s and 90’s. These models possess oversized aluminum tubes for increased stiffness, resulting in extremely light frames that are super-stiff and super-efficient. I own or have owned a number of Cannondale hybrids over the years, including a classic 1985 Continental Blue SC300 Town and Country, a 1991 Guard’s Red SH600, a 1996 Deep Teal H200, a 1996 Really Blue H300, a 1997 Galaxy Red H500, and a 1997 Bordeaux H700 Hybrid (pictured above). Although a hybrid, this bike is currently outfitted with different componentry and thinner wheels. So despite being equipped with riser instead of the more traditional drop handlebars, it really rides more like a road or racing bike. I bought this bike from a local bike shop in New York through another eBay auction. However, when the box arrived and I unpacked it, it was not the bike on which I had bid. Instead it was a Scott Metrix Hybrid. The bike shop accidentally shipped the wrong bike to me, and shipped the bike I had bought to the person who had won the auction for the Scott bike. Now the Scott was a nice enough bike, but I preferred the Cannondale I had actually bought. In the end the seller made it right by paying for the additional shipping costs to switch the bikes, and the Cannondale eventually arrived a couple of weeks later. Sometimes when I see a Cannondale hybrid that’s the right size and from my favorite era, the mid-90’s, I think that I should buy it because I tell myself I might need it and I can’t really be sure if or when another one will come along. 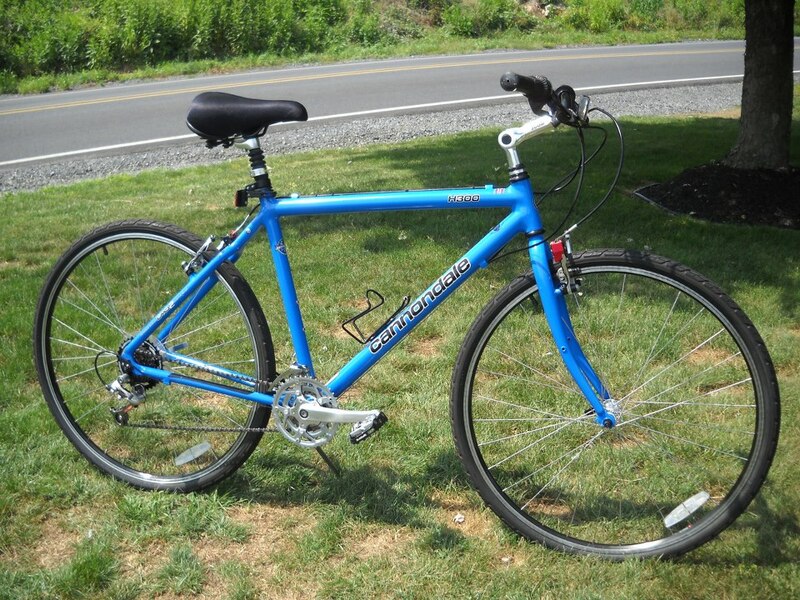 That was the case with this 1996 Really Blue Cannondale H300. When I came across it online at an out-of-state used bike shop, the shop agreed to deliver it one of my sisters who lived in the area. I then picked it up the next time I went to her house for a visit. 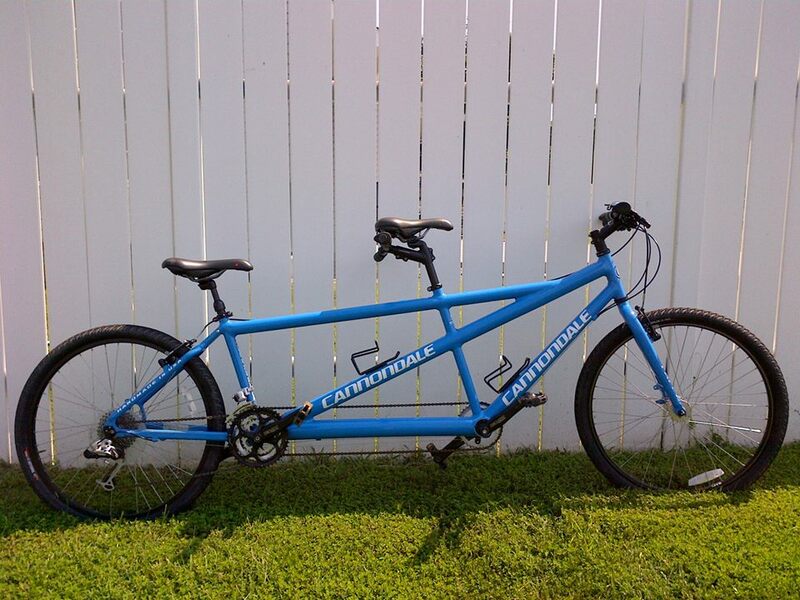 As the second half of a pair of fraternal “twin” Cannondale hybrid bikes, this Cannondale H300 is named Ashley. 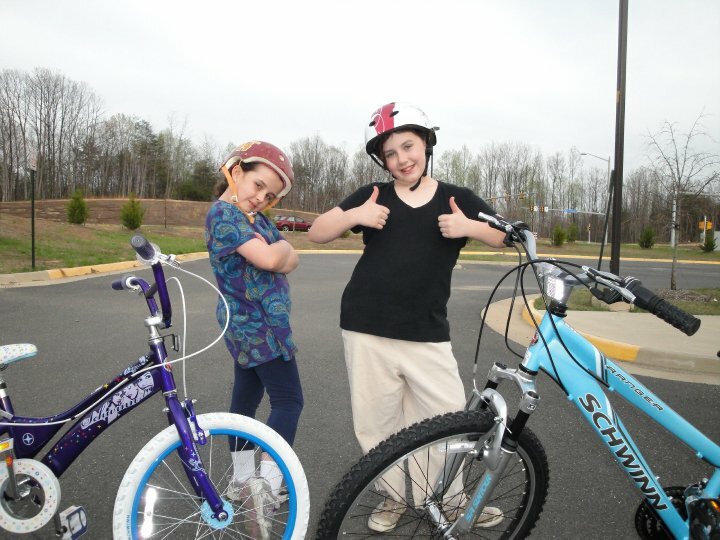 Her sister, the Cannondale H500 shown above, is named Mary-Kate. 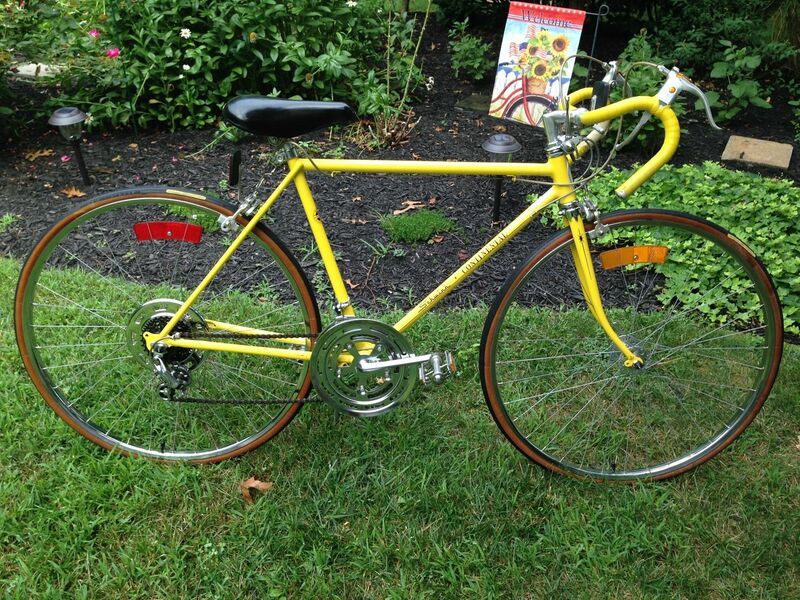 Out of a sense of nostalgia, I also have a classic 1975 Kool Yellow Schwinn Continental. Her name is Summer. A higher-end model compared with Schwinn’s more popular Varsity, the Continental featured a flash-welded frame and tubular fork, and offered better wheels, tires, pedals, and a better saddle than the Varsity. Summer was manufactured in Chicago before Schwinn began outsourcing to Japan for their frames and parts. The year this bike was made was the same year the Vietnam War ended, mood rings and pet rocks were introduced, Saturday Night Live premiered on NBC, and hip-huggers, bellbottoms and leisure suits were in fashion. It was also the same year that I became a teenager. It’s the kind of bike I would have liked to have had at that time. But I would not get my first “10 speed”, as we usually referred to them back then, for another year or two, when I was able to save up enough money from my after-school paper route. At one point not too long ago I had to take a short break for health reasons from my daily lunchtime bike rides. When I was able to start riding again I decided to celebrate by buying another bike. In reality, it was really just an excuse to buy another bike. As if I actually need a reason for that. Anyway, I had been looking at the bikes for sale on Craigslist while I was sidelined, and liked a number of ones listed. In fact, I almost bought a different one that was in almost new condition. And it was an almost unbelievably good price. But I got a bad feeling about the seller when he sent me a follow-up Email on the same day I initially contacted him asking if I was still interested. When I responded that I was he sent me another Email stating that I should meet him “right now”. But that Email was sent just before midnight. The attempt to pressure me combined with the low price he was asking, and the creepiness factor of wanted me to meet him in the middle of the night, made me think that it was quite possible the bike was stolen or that it was some type of scam. I checked some of the online registries for stolen bikes but I couldn’t find it. However, when you have a bad feeling about something it’s usually for a reason. So I decided to pass on that bike. There wasn’t anything particularly special about the bike anyway. 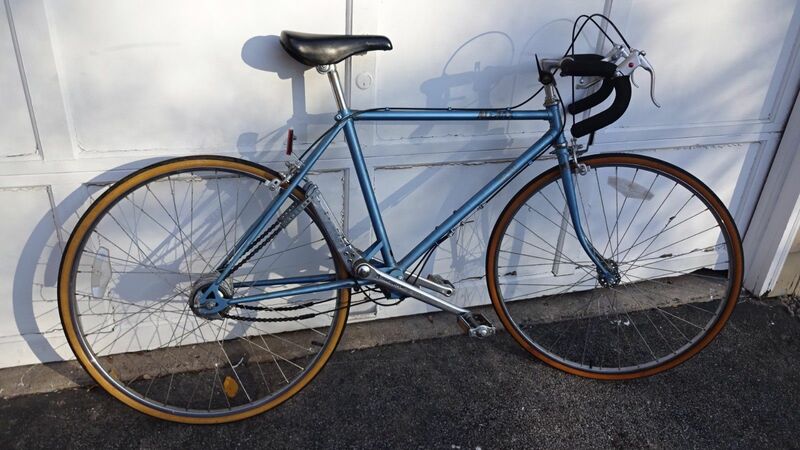 Instead, I ended up buying another classic bike. And it is special. And in the end I think I got a much better bike. 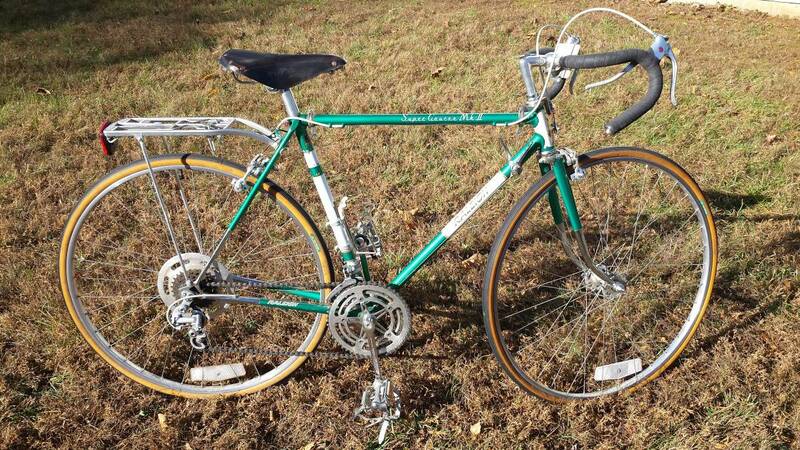 It’s a 1975 Emerald Green and White Raleigh Super Course II, and was manufactured in the same year as my Schwinn Continental. The bike is in mint condition both mechanically and aesthetically, and boasts a 21″ frame constructed with Reynolds 531 butted tubing, along with Weinmann 27×1 1/4 rims with Normandy Wide Flange hubs, a Huret Jubilee front derailleur and Sun Tour rear derailleur, a Nervar Sport crankset and Sun Tour Perfect 14/28T rear cluster, and Weinmann Vainqueur 750 center pull breaks. And according to the serial number on the bottom bracket, which starts with WB, the bike was made in England. 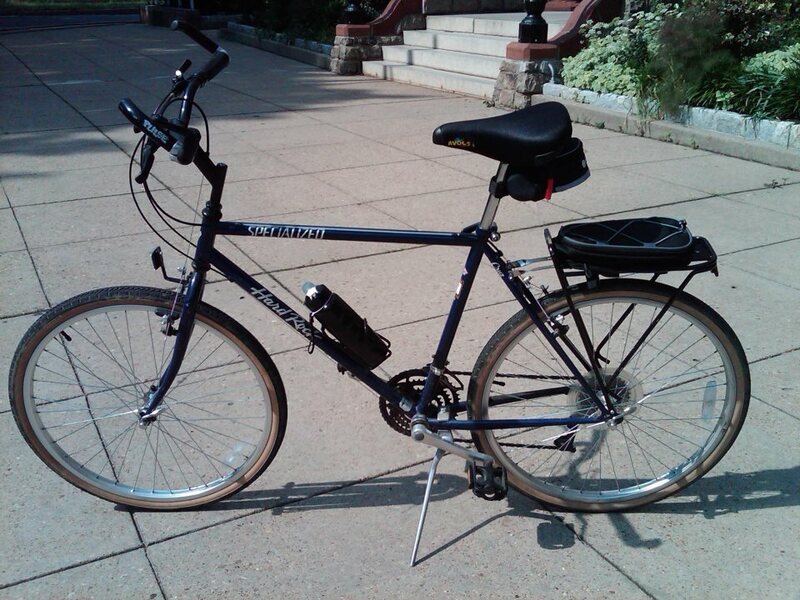 I also have a Columbia Sports III 3 three-speed bicycle. It is one half of a his and hers set made by Columbia, the oldest bicycle company in America. According to the serial numbers they were manufactured in 1971, making them the oldest bikes I own. I bought them on eBay from someone who had bought them at an estate sale and then disassembled, cleaned, and lubricated everything. And with the chrome mostly shiny and the paint mostly fresh they appear to have been kept indoors their whole lives. The tires may be original on one or both but there was no dry rot and they had good tread when I bought them. The men’s bike has Kelly Springfield tires made in USA, and the women’s has Goodyear Rib All Weather made in USA. They are equipped with chrome Araya 26 by 1 3/8 inch rims, Weinmann Type 810 sidepull brakes, original Mesinger saddles with no tears, and Sturmey Archer 3 speed hubs and shifters made in England. There are nice badges on both, and they were manufactured in Westfield, Massachusetts. These bikes are kind of like tuxedos, and not just because of their elegant black and white appearance. Like tuxedos, they are not used often but are just right for certain formal and semi-formal special occasions. For example, these bikes are more suited than most of my other bikes for local “tweed rides.” Sponsored by a D.C. social group known as Dandies & Quaintrelles, tweed rides are vintage-inspired, stylish events in partnership with and in support of noble causes and charities. D&Q was founded in 2009 on the ideals of refined style and purposeful living, and their rides reflect that. In keeping with their old-fashioned, refined styling and vintage age, I gave them classic names. This couple’s names are Clarence and Agatha. 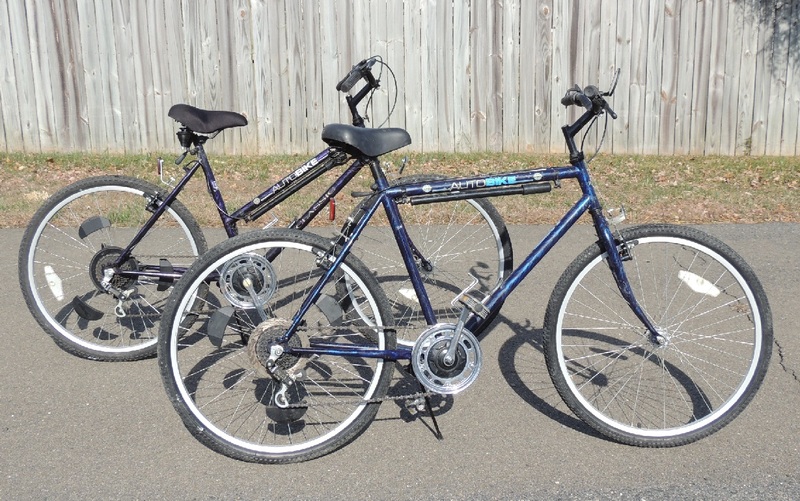 In the novelty bike category, I also have a pair of his and hers original 1998 Violet Splash CSA Auto-Bike Classics. I found them when they were listed for sale locally on Craigslist. It had been at least twenty five years or so since I thought of these bikes, but when I saw the listing I immediately remembered the late-night TV infomercials from the late 1990’s, which is how they were originally marketed and sold to the public. In general, an autobike is a bicycle with an automatic derailleur that shifts gears by itself without initiation or intervention from the rider. It’s different from other bikes in much the same way a car with an automatic transmission is different than one with a stick shift. These original Auto-Bikes had a system of three weights mounted on the spokes of the back wheel, which is attached to the “pie plate”. When the rider starts pedaling centrifugal force causes the weights to move outward from the wheel’s hub, and pull the pie plate out farther to the right, pushing the derailleur towards the smaller cogs and shifting gears. It has six cogs, 14 to 28 teeth, fixed to the hub, with a front sprocket freewheel system. The bike can then shift up or down whether or not the rider is pedaling. Coming to a stop causes the weights to return to the center position and shift back to the lowest gear so that it is ready to get stated again. It’s such a simple system that not much can go wrong with it. The following video shows how the weight system and derailleur work to change gears automatically. The original Auto-Bike Classics were produced between 1995 and 2000 by CSA Inc. of South Easton, Massachusetts. CSA is a worldwide retailer of TV-driven fitness merchandise and products. Also falling into the category of what I would call novelty bikes is my pair of his and hers 1985 Pale Blue Alenax TRB 2400 Transbar Power bikes. They are very unusual bikes that I had never heard of before. Alenax bikes were an attempt during the 1980’s by a Taiwanese company to revolutionize the basic mechanical concepts underpinning bicycles by changing the rotary motion of the pedals to an up-and-down movement. This was supposed to approximate a natural walking motion. So anyway, I saw one listed locally on Craigslist, and it intrigued me. So to try to find out more and have something to compare the price with I searched eBay. But despite 38,047 auctions for bikes listed at that time on eBay, there was not even one for this kind of bike. So I did a nationwide search of all Craigslists, and found some for sale in Rochester, New York, which is the home of the manufacturer of these bikes, the Alenax Bicycle Corporation. Actually, there were three for sale. And not only were they a better price, but they were also in Rochester, which also happened to be the same place where I already had a bike in my cousin’s garage waiting to be picked up. So I sent an Email to the woman selling the bikes on Craigslist and told her I did not live in the area but would be coming there in a couple of months. She said she would store them for me until I could get there. So I sent her the money, and then later went and picked up all three bikes that were waiting for me. What makes Alenax bikes so unusual is obvious as soon as you see the pedals. The pedals on an Alenax bike go only up and down in a seesaw motion rather than in a circular motion all the way around. At first glance, the mechanically minded can see the transbar system’s simplicity and potential advantages. As one foot pushes a pedal downward, the other pedal rises, ready for another downward stroke. Less motion from the legs is required and less energy is wasted in the transbar pedal system. And the arms on which the pedals are mounted are longer, so the added leverage gives more power per stroke. It takes some getting used to, but that’s all part of the fun. Alenax Transbar Power bikes would only my manufactured for eight years, with production ceasing in 1993. My bikes were made in 1985, the first year they were made. That makes them not only a couple of the more unusual bikes in my collection, but an interesting part of cycling history. I also have a novelty bike which has no pedals. It is a 2016 green GlideCycle PT X-Runner running bike. Marketed as being designed for the athlete in each of us, it seems more like fun than a workout. Often referred to as the “Fred Flintstones-mobile” of bicycles, its saddle lifts up to 90% of the rider’s body weight while the rider powers the bike through running. And since I have two surgically rebuilt ankles, it makes it possible for me to run without pain, even though I am also biking at the same time. It is the world’s first bicycle designed to feel like real running … but with wheels, increasing both your speed and endurance. Weighing in at just 37 pounds, it is constructed with a light, chrome-moly-steel frame, that is powder-coated with zinc and chrome plating that brings a high level of quality and durability to the GlideCycle. And it is easily disassembled into its custom carry bag for transport, allows you to carry it onto a bus, toss it into the cargo area of your car, or store it anywhere in your home. One of the reasons I couldn’t pass up this bike was because it had barely been used. The man selling it bought it for his wife. But she rode it less than a mile and said she didn’t like it, and never rode it again. I guess he should have checked with her first. The other reason I couldn’t pass it up was the price. I got it for 79% off the cost of a new one. If I had to name one criticism of the GlideCycle it would be that whoever named missed the opportunity to call it the GlideRide. Although most of time when I’m riding I am alone, I have also acquired bikes for multiple riders so that I can share the biking experience with my family, especially my two daughters. Tandem biking adds a whole new aspect to the experience, requiring cooperation and teamwork between the captain in the front, and the stoker(s) in the rear. Beyond that, it’s just plain fun. And like with a recumbent bike or a trike, the looks you get when you’re riding a tandem are fun. 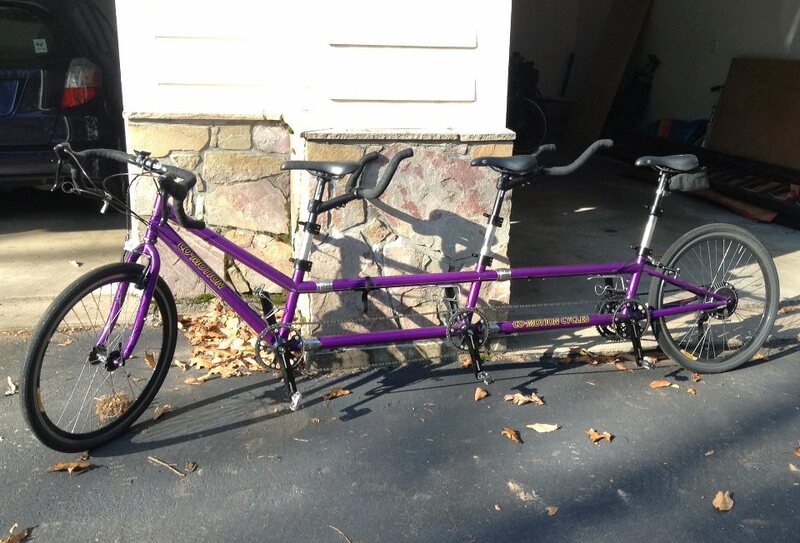 You get even more looks when there are three people riding a triplet, like our family’s 2005 Dark Plum Co-motion Cycles PeriScope Trident Convertible. Some of the features of this triplet include: a hand-built frame with zonally-butted Co-Motion design cromoly steel tubing; 26” wheels for versatility and strength, and; a convertible design that has super-low stand-over clearance. And the stainless steel couplers in the frame allow it to be converted from a triplet to a tandem, and back again. The couplers also make it easier to break down for transporting. I found this bike by using an online search engine that searches all the local Craigslist ads and then compiles the nationwide search results. The bike was located in Connecticut, but I got such a good deal on it that I drove up and back in order to pick it up myself. It is easily the most valuable bike I own, retailing for well over $8,000 new. However, what I paid for this triplet was not anywhere near even half that much. A bike on which I have enjoyed some of all-time my favorite rides is also made by Cannondale – a 2008 Mediterranean Blue Street Tandem. 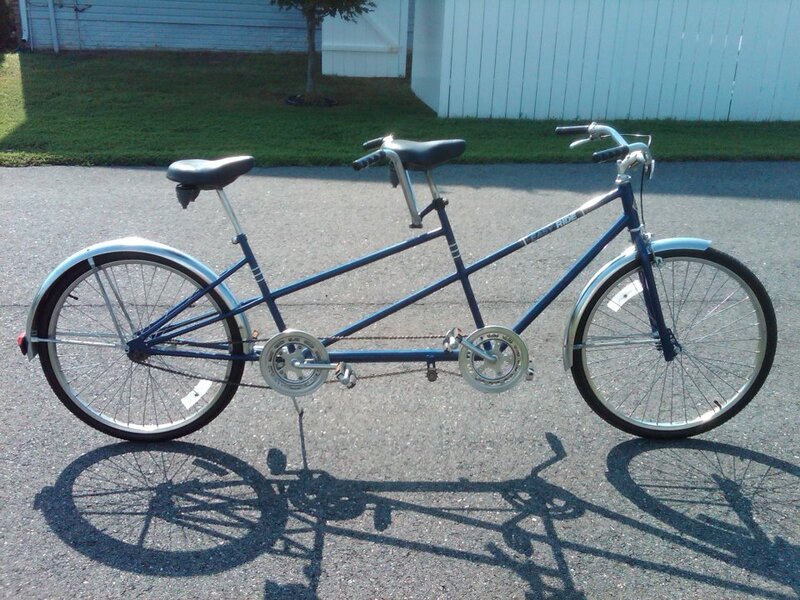 Our family has had other tandems, but this one seemed almost custom-made for us, so I couldn’t pass it up when I saw it for sale on Craigslist. And although it was not located in the local area at the time it was for sale, I found out that the person selling it would be travelling through the D.C. area shortly after I intitially talked with him. So I ended up being able to have it delivered for no charge. It has a large/small frame, which is the perfect size for me in the front and the right size in the back for any of the shorter female members of my family. My daughters and I not only take it on sightseeing trips in D.C., and to local trails and parks, but sometimes ride it to church on Sundays as well. This bike has even been blessed by a priest at the Blessing of Bicycles. My 1996 Dark Blue Trailmate Easy Ride Tandem is made of straight gauge stainless steel and chrome, and feels like it weighs a ton. And with its one-speed rear cog and coaster brakes the bike has much more limited use than higher end models like the Cannondale Street Tandem. But it has a classic look, is as durable as a tank, and can be a lot of fun to ride under the right circumstances. 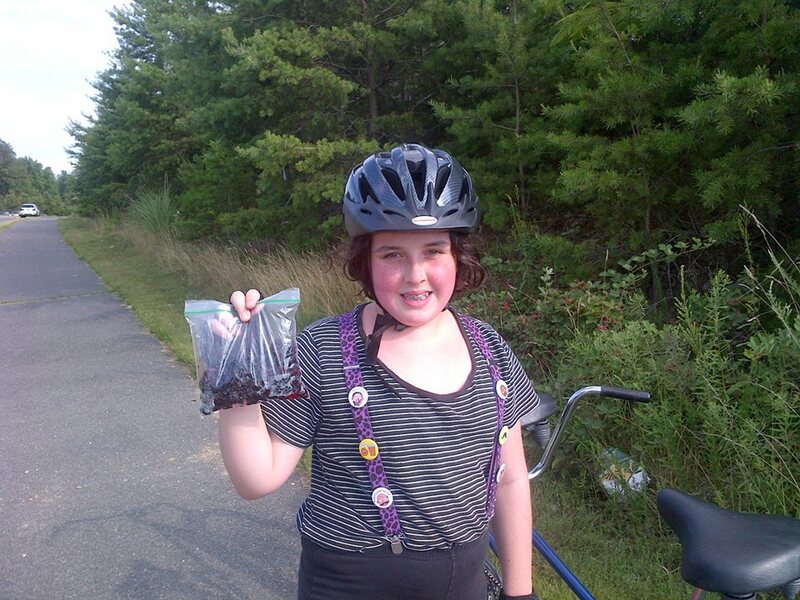 It’s a great limited-use, back-up bike which my daughters and I use to ride around the neighborhood, or to a field along the nearby Potomac Heritage National Scenic Trail where we go to pick wild blackberries during the summer. Perhaps the least practical bike I own is this vintage novelty bike – a 1980 Buddy Bike. Because the seating is side by side it is referred to as a sociable, rather than a tandem, in which the riders sit fore and aft, or in-line. I happened upon it through a listing on an online used bike shop, and just couldn’t resist. This was the only model sociable the Buddy Bike company made, and it is no longer in production. Both riders pedal, but only the rider on the right steers and breaks. The rider on the left simply holds on. The biggest issue with the Buddy Bike is the technical challenges it presents with balance, but that is also part of its charm and the fun in learning to ride it. Traditionally, unicycles were most often seen being ridden by clowns in circuses or by street performers at festivals. But that is beginning to change. Unicycles now have various combinations of frame strength, wheel diameter, crank length, and even multi-speed hubs, depending on the type of riding. Types of unicycles now include freestyle, mountain (or munis), trials, basketball, commuter, street, cruiser and giraffe. There are now even electric unicycles. Mine has a steel frame with a chrome finish, a 20″ wheel with an alloy rim, cartridge bearings, and a saddle height with a quick release seat clamp. It is manufactured by Fun. And it is. These are a few of my favorite bikes, and some of the stories behind them and how I came to own them. I now own so many bikes that out of financial necessity I decided I needed to learn how to perform maintenance and repairs on them myself. So I took a class and bought some tools, and bit by bit I am learning. Also, there are still more bikes remaining on my bucket list of bikes, such as a recumbent tandem, a four-wheeled or “quad” bike, a folding bike like a Brompton, and perhaps a penny farthing. As a result of recently test riding both an Eliptigo and a Street Strider, I’ve also developed an interest in stand-up bicycles. So there is still plenty of room for expansion of my collection in the future. There is actually a mathematical formula to calculate the optimum number of bicycles to own. That formula is N+1, with “N” representing the number of bikes you currently own. However, I’m having so much fun riding the variety of bikes I already own that I’m in no real hurry to buy another one. But since I can never be sure when the right opportunity for my next bike might present itself, I am keeping an open mind. previously owned over the years. Wow! What an amazing collection of bikes you have. I can’t imagine where you keep them all. The triplet looks very cool…and maybe hard to balance on! I’ve never heard of this kind of bike before. Are you scared of getting run over in DC on the recumbent bikes because you are so low to the ground? I have a Specialized hybrid with a basket on front. The Washington Post should do an article on you…this is really fascinating! I keep some of my bikes in the parking garage of the building where I work, and some of them at home in my garage or a shed in the backyard. Eventually, I’ll have to start getting rid of some, or find more places to store them if I continue to add to the collection. I have never had a concern riding a recumbent in D.C., or anywhere else for that matter. I try to make myself visible with my clothing, flags and/or lights, and to ride responsibly and safely. Also, there are a significant number of trails and even roads in D.C. where there is no vehicle traffic. I’m glad you’re enjoying the blog. Please keep reading, and keep riding. it’s obvious that you are a true bike enthusiast. but you gave a mixed review to my favorite bike in the world… the buddy bike. so i thought i’d write in the hopes that this info might increase your appreciation of this wacky and wonderful creation. a buddy bike is not aerodynamic enough to win any races; but it has a whole different purpose. for a fairly flat cruise in a parade or just out for a sunday spin on the mall, this is the tops. it is more fun than a barrel of monkeys. ride it where people congregate. parks and downtown areas are particularly fun. ride it with a spouse or girlfriend or date and it’s an instant hit. it does take a bit of learning and getting used to. the driver learns the ritual for starting and stopping and the passenger learns to trust and take cues from the driver. here’s the easy ritual for starting and stopping. it takes a bit of practice, but it’s not hard to get used to. 1] the driver gets on with his/her inner foot on the pedal and outer foot on the ground. 2] the passenger gets on with both feet. 3] the driver pushes off to get started. 4] when stopping but not getting off, the driver puts his outer foot on the ground while stopped, and pushes off to get started again. the passenger keeps both feet on the pedals the whole time. 5] when stopping and getting off, the driver puts down his outer foot as the bike comes to a stop. the passenger gets off completely. the driver gets off. to my own buddy bike, i’ve added toe clips to the pedals, better seats (a double-saddle seat for my gf), an iPod stereo system (box-like speakers banded to the frame uprights), and pannier packs and frame to the back for carrying tools, food, water and clothes. 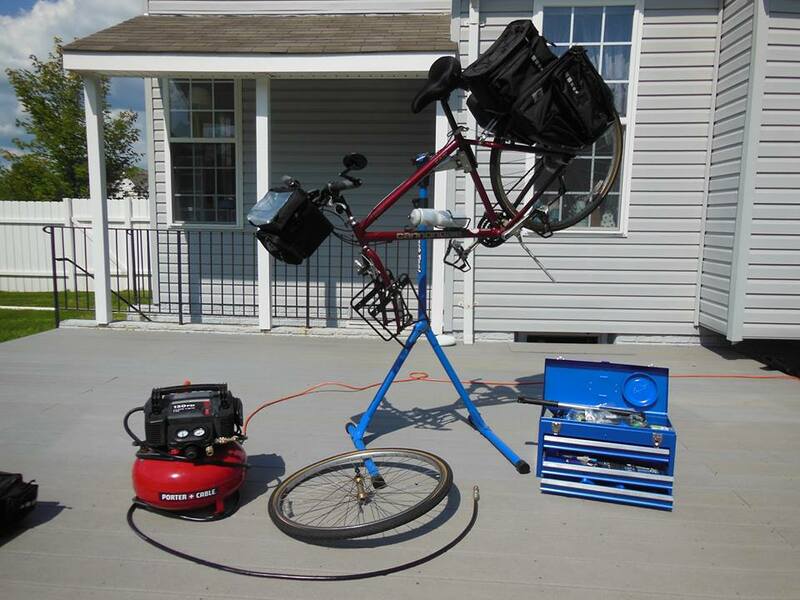 anybody want to sell their buddy bike? i might buy it. Hi – I hope your treatment is going well and things are looking up. I have my fingers tightly crossed that the doctors have caught things in time for you (sounds like they have) and they can get your cancer under control quickly. Contacting you as I have an old Cannondale h700 very similar to yours from 1997 I think you said? Mind is also the purple colour (bordeaux? 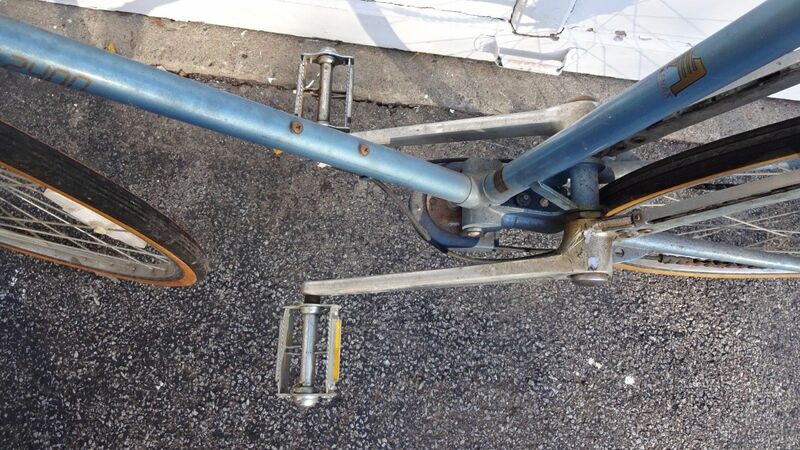 ), but has the dropped bar frame. I am thinking of kitting it out to use cycle touring, and would be very interested to hear your thoughts on that option. Also I’m noting from your pics that the handlebars were on a riser bar. I bought mine second hand many years ago, but it has a different set up on front. I think this would affect handling quite a bit, and would be interested to know if they came out with different fronts on them (if you know). I would prefer to bring mine up a little, but hadn’t done that up until now because I thought mine was the original shape. I think the Cannondale H700 could be made into a touring bike with the right wheels. 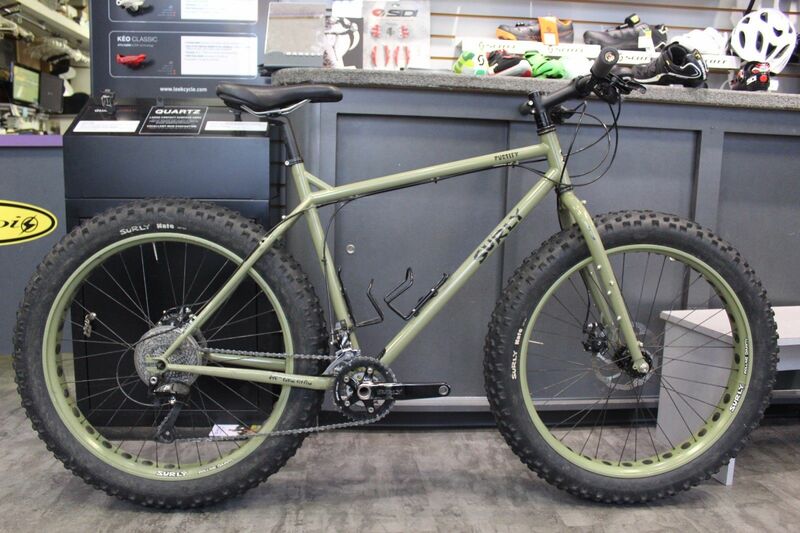 Mine is outfitted for the road, and probably wouldn’t hold up on unpaved trails like the nearby C&O Canal Towpath. 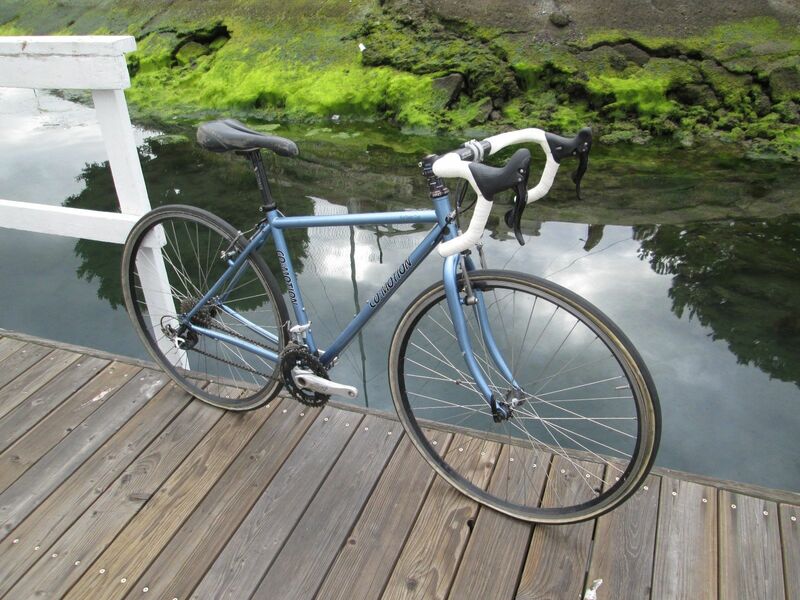 But I have another Cannondale, an H500, which has wider wheels and is outfitted for touring and it does well. I bought my H700 used as well, and I don’t know if they were available with different fronts when they were new. With that being said, I’m not a big advocate for keeping everything original, unless the bike is being kept as a showpiece. Otherwise, I’m all for changing anything and everything you want to in order to make the ride better for yourself. Please let me know what you decide to do with your H700 and how things work out.